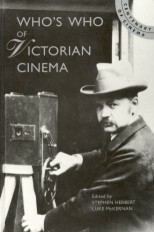 Trewey is chiefly remembered today for having introduced the Cinématographe-Lumière into Britain in 1896. Before that, he had enjoyed an international reputation on the music halls for his brilliant acts of ombromanie, or handshadows, balancing feats, and clever manipulations of inanimate objects. His 'chapeaugraphy' involved transforming a simple piece of felt into any number of shapes to represent the headgear worn by particular characters which he reinforced with the appropriate facial expressions. Trewey was born at Angouleme and became one of the most popular entertainers in Paris during the latter half of the nineteenth century. He also travelled extensively in Europe and America. He was no stranger to English audiences when he arrived in London with the Cinématographe, for he had made several previous appearances at the music halls. In 1888, he played the old Alhambra (the future venue for Robert Paul's Animatographe) where he was billed as 'Mons. Trewey, the Fantasiste, Humoristique, in his Shadowgraph Entertainment'. 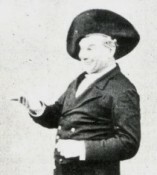 Trewey was a friend of the Lumières and had appeared in several of their early films, including Assiettes tournantes (Spinning Plates); Chapeaux a transformation (Hat Transformation Tricks); and Partie d'écarté (A Game of Cards). It is not surprising therefore that he should have received the exclusive concession for exhibiting the Cinématographe-Lumière in Great Britain. He gave his first Cinématographe performance at the Marlborough Hall, Regent Street, on Thursday afternoon, 20 February 1896; a press show, with Britain's first cinema performance to a paying public taking place the next day, 21 February. Shortly afterwards, he was engaged by Stoll Theatre Group to give shows at the Empire Theatre, Leicester Square, opening on 7 March. One of the acts sharing the bill with the Cinématographe was a minstrel troup, and Trewey arranged to have them filmed performing, in a nearby street. The busy frontage of the Empire was the subject of one of several 'actualities' directed by Trewey in England. Another was of traffic around Piccadilly Circus. Presumably he arranged for Matt Raymond, electrician/operator at the Polytechnic, to operate the camera. Trewey appears in one film himself, Cyclistes et cavaliers arrivant au cottage. One story about Trewey tells of a street scene that came out very badly; he made a virtue of necessity and billed it as 'London in the fog'. Trewey subsequently appeared in other towns in England, Scotland and Wales where other Stoll theatres were located.